When the fourth Doctor and Sarah Jane Smith took a trip to London in 1887, they didn't count on being dragged into a petrifying alien conspiracy that stretched all the way back to Ancient Greece! Pursued through the streets by the fearsome Scryclops, and at the mercy of the mysterious Lady Emily Carstairs, the pair must team with Professor Odysseus James and his adventurer daughter, Athena, to avoid a horrifying fate, one already set in stone! 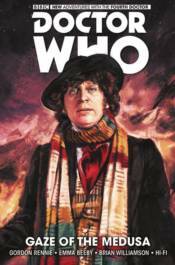 Collects Doctor Who: The Fourth Doctor #1-5.